Our last full day in London, we decided that it would be nice to go on another London Walks tour, this time choosing a tour of the River Lea and the canals, ending up at the Olympic Park site by the Pudding Mill Lane DLR station. But on the way out there, we decided it was a good opportunity to grab some Vietnamese food, primarily since Carol and I don’t get a lot of good opportunities for Pho (the nearest Vietnamese restaurant to our house in New Hampshire is 45 miles away). While London definitely doesn’t have anywhere near as much of a Vietnamese population as the United States, it still has enough Vietnamese people to have a reasonably good community and several restaurants, mostly centered in Shoreditch, mostly located on Kingsland Road. So we hopped on the bus, met up with my friends Rick and Sarah at Liverpool Street Station, and then took the bus up to Kingsland Road to go grab some Pho at Song Que, which is generally well reviewed. Well, that particular day, Song Que wasn’t open, but since Kingsland Road has several Vietnamese places, we settled on Tay Do, which is just down the road, and has a reputation for good spring rolls. Confusingly, Tay Do is really two places, Tay Do Cafe on one side of the street, and a more formal dining room across the way (then again, this is London, where over on Edgeware Road, Maroush runs at least three restaurants, a cafe, and a juice bar all within about a 100 foot radius…). We opted for the more formal dining room. We started off by ordering a raft of appetizers, ordering three different varieties of Vietnamese egg rolls (cha gio). Here’s where I made what’s generally a rare mistake for me: I forgot to take photos. Which is a shame, since these were actually very good spring rolls. Despite looking a bit greasy to start with, all three varieties (mixed pork and chicken, pork skin, and classic pork and rice vermicelli) were nicely crisped, not overly greasy, and had a very pleasant spicing to them. These were definitely some of the better cha gio I’ve had in recent history (the most enjoyable being at Bona in Minneapolis last spring), and a really pleasant way to start the meal. My pho? It was quite a good bowl of pho. The broth was very flavorful, the meat nicely thin and flavorful (I opted for both well-done brisket and rare beef, my usual combo if tendon isn’t easily available), and the noodles nicely cooked without falling apart. 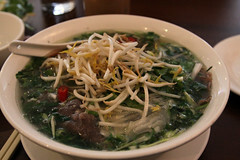 A good, quality bowl of pho, just the perfect sustenance for an afternoon of walking along the canals. Overall, Tay Do was a pleasant Vietnamese restaurant, one that reaffirmed that London continues to maintain a good overall selection of Asian restaurants. Normally, even when I go to fairly obscure places (like, say, Iceland), it’s still pretty obvious, between my reviews and the geocoding, where I went. But this year’s vacation took us to yet another island destination, this one not even a blip on even most adventuresome Americans’ radar. Indeed, when telling people where this year’s vacation destination was, aside from one French coworker, everyone’s immediate response was “Where?”. This “mystery destination” was the Île de la Réunion, a small (smaller than Rhode Island, although much more rugged), volcanic island, located 550 miles due East of Madagascar in the Indian Ocean. It’s actually an “overseas Department” of France, which gives it a status similar to Hawaii, in that it’s actually considered part of France and not a territory or colony (but, a bit oddly, not part of the Schengen Treaty Area, so a flight from Paris to Réunion was actually “international” with duty-free shopping). If I had to come up with a short and reasonably accurate description, it’s basically the French version of the big island of Hawaii: beaches, volcanoes, great scenery, coffee (and vanilla, and banana…) plantations. And, for a number of reasons, tourism there, until very recently, was almost exclusively consisting of people from mainland France.